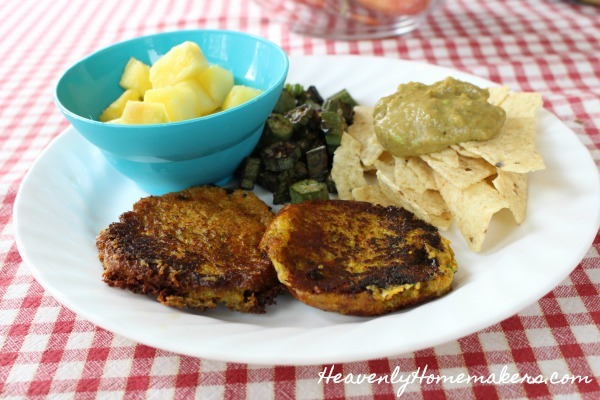 With these Simple Veggie Fritters, you can present your family with a satisfying meal made entirely of fruits and veggies! I will admit: I wasn’t sure how well this recipe experiment would go over with my family. I was prepared to get out the Ranch Dip for them, assuming these Simple Veggie Fritters would taste extra good that way. But guess what? I didn’t even need to get out the dip. My kids at the Veggie Fritters without coaxing. And here I had an entire speech prepared. 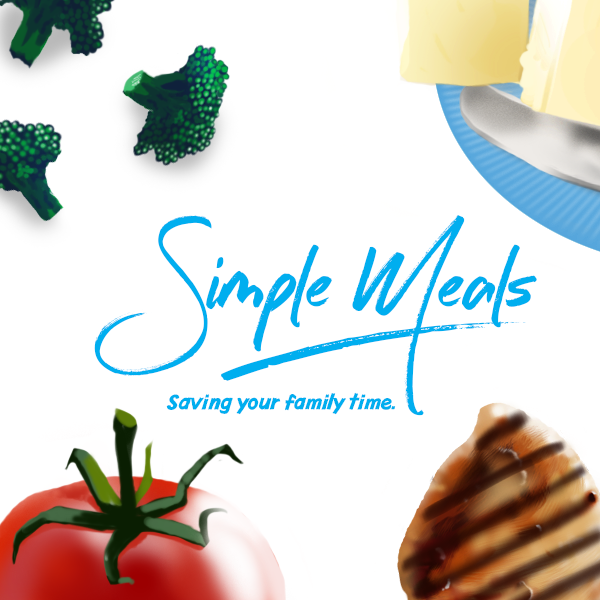 What I’m loving most about all these Simple Meals on a Simple Budget recipes is that it’s teaching us ways to go meatless a little more often. We definitely still love our meat around here, but there really are many ways to fill my family without killing the fatted calf. 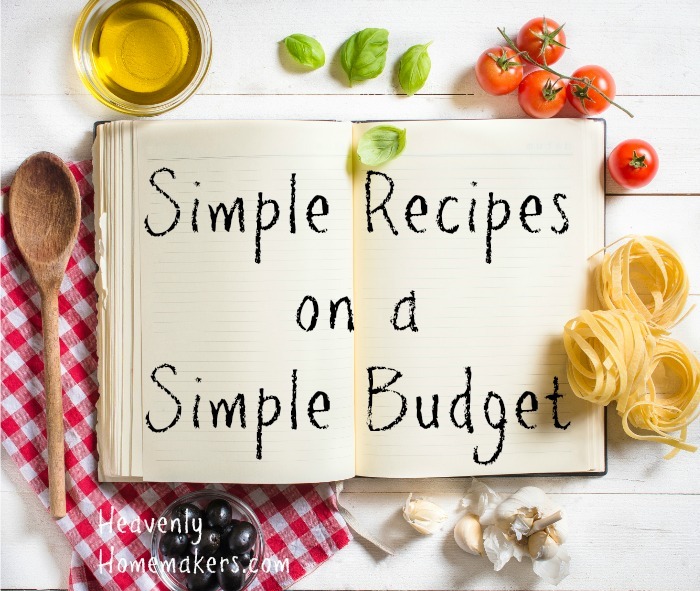 This is a great budget saver, something we can all be very grateful about! 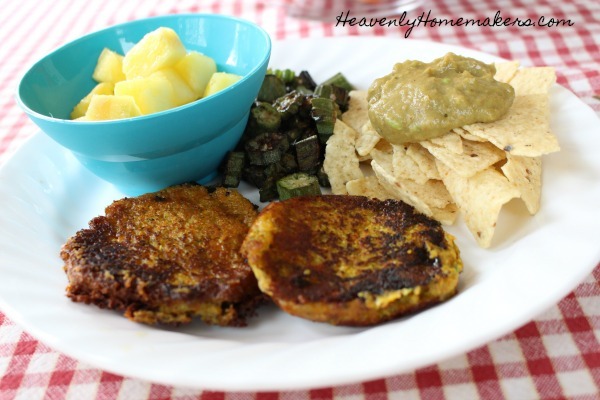 As you can see from the pictures, I served these Simple Veggie Fritters with a fun variety of other fruits and veggies that filled us up and offered us great nourishment! I dug garden okra out of our freezer from last summer and fried it in oil with salt. I cut a fresh pineapple. I got Homemade Guacamole out of the fridge. We ate like kings (and queen). I’m sure we had meat with our evening meal later that day. But for lunch? We ate all the veggies and fruit and felt great! Grate the zucchini and carrots into a bowl. Scoop veggie mixture into hot oil, pressing down to make patties. Fry until each side is golden brown, about 2 minutes each. These were excellent!! My 3 year old ate 4 of them :) My (picky) girls of course couldn’t be convinced. Thanks! I tried to sign up for your 30 tips book and it is rejecting my email address. It is the same one I’ve used for your site before.